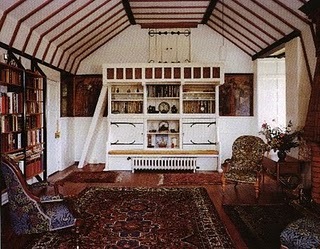 This room is from William Morris’s first home which was designed by architect and friend Philip Web. This room, known as “Red House” was completed in 1860. In my opinion this room is breath taking, with the white walls, vaulted ceiling, and wood detail. The persian rug makes me laugh a little because two centuries later they are still one of the most popular rugs. The wood floors are classic and the furniture gives it the traditional feel that many people will now pay a large amount of money for.